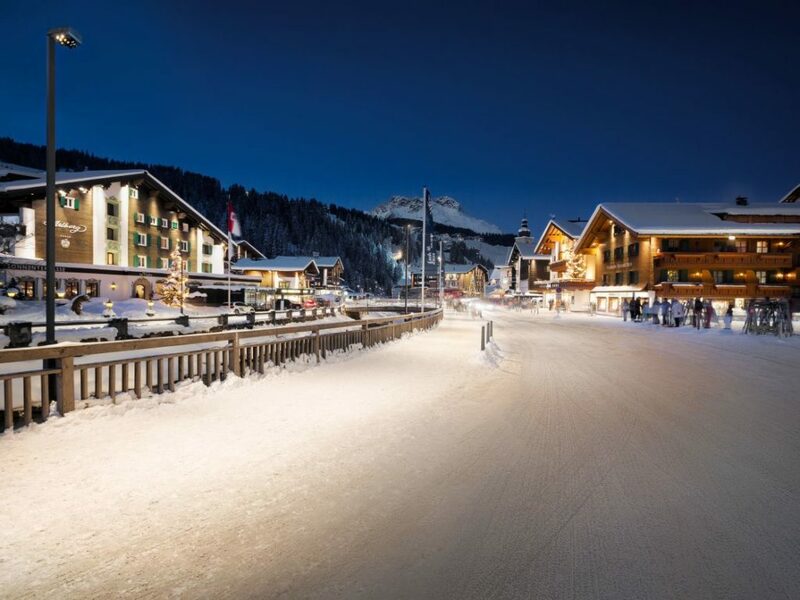 (A) The night image of the Lech ski resort has been improved by a new LED lighting concept. 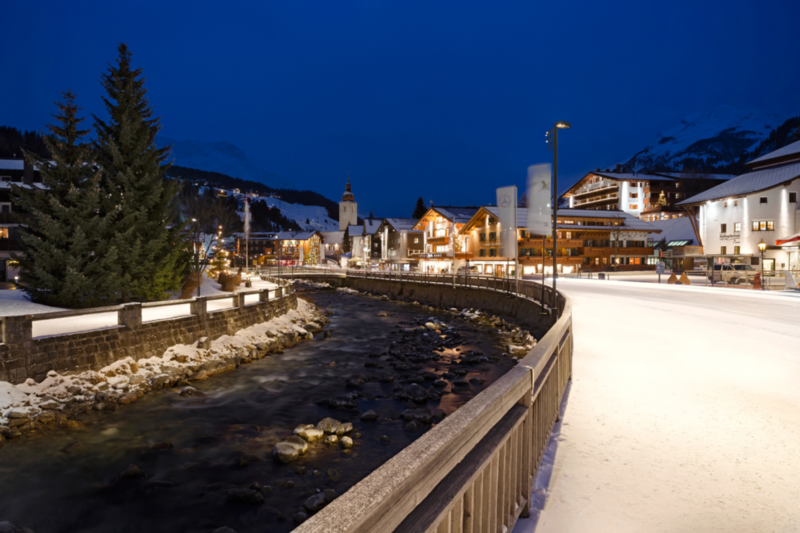 Zumtobel in cooperation with Dieter Bartenbach, the consultant specialist, has developed a customized outdoor illumination solution, providing a new image both to the town of Lech, and to the river bearing the same name. A specially-created control system adjusts the light levels depending on the time of day or night, for lighting conditions to be perfect at any time. Lech am Arlberg , Austria, is a picturesque ski location on the banks of the Lech river, surrounded by an impressive mountain landscape, rising up to 2809 meters above sea level. The small, 1500-inhabitant town sustains itself through tourism. With approximately 8300 available hotel beds, Lech reports nearly one million overnight stays per year. The dwelling was preserved as a small village-type settlement, having, however, very high standards, and in the past Lech has been awarded with the title of “the most beautiful village in Europe”. The initial state of this space was, as is the case with many other settlements, a total mayhem of illumination, blurring the town’s urban landscape. Diffuse light is usually caused by the conventional outdoor lighting, which mostly involves wide-light distribution lamps. On top of those, the illumination of storefronts and of advertising is excessive, so that the town’s authentic image is completely obliterated. “The perception of space is overthrown by the fact that the viewer’s attention is exclusively drawn to the sources of glare”, Bartenbach explains. 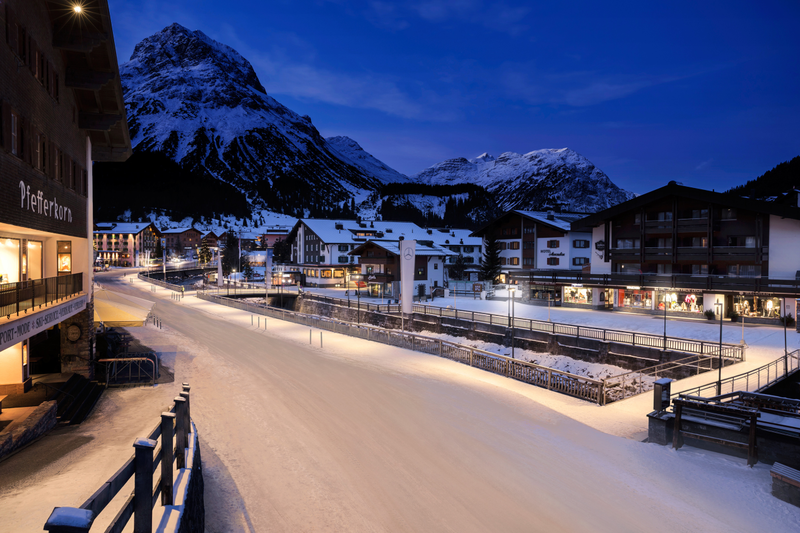 The new concept makes it so, at night-time, the town of Lech with its typical characteristics – hotels, river, streets – are deliberately highlighted by the LED lighting solution, which provides an accent light and defines the space. The light fitting specifically made for this purpose breaks the intensity of light in several LED points, so that passers-by are no longer blinded. Besides, the light is much more precise and better targeted than before. Another advantage is the modular design, similar to a system of tubes: light fittings can be configured with 6 up to 24 LED points, each of approximately 2 W. Thus, lighting can be adjusted function of needs. Also, Zumtobel has developed different versions of the poles, fit to their placement. The main specific element of this village is given by the linearity of the urban area, which is now highlighted through the new lighting solution. The main street is pleasantly lit like an esplanade, and so are the river and the facades. The creation of a visual perception of the river, now highlighted at night as well, was an aspect planned by the designers from the very beginning. Light brings the river to the town, outlining the bank walls. This approach provides a dynamic image, which captivates through the movement of water currents, resulting in a three-dimensional effect. The light is distributed more efficiently: from dusk till 10 PM, the urban space is fully illuminated. After 10 PM, the lighting on facades is turned off, and at midnight the level of light on the streets is reduced to ambient level. The control of lighting intensity is made through a web control system: each light fitting contains a radio-frequency sensor which allows its control. This way, the concept of Smart City is also inserted in the Vorarlberg Alpine landscape. 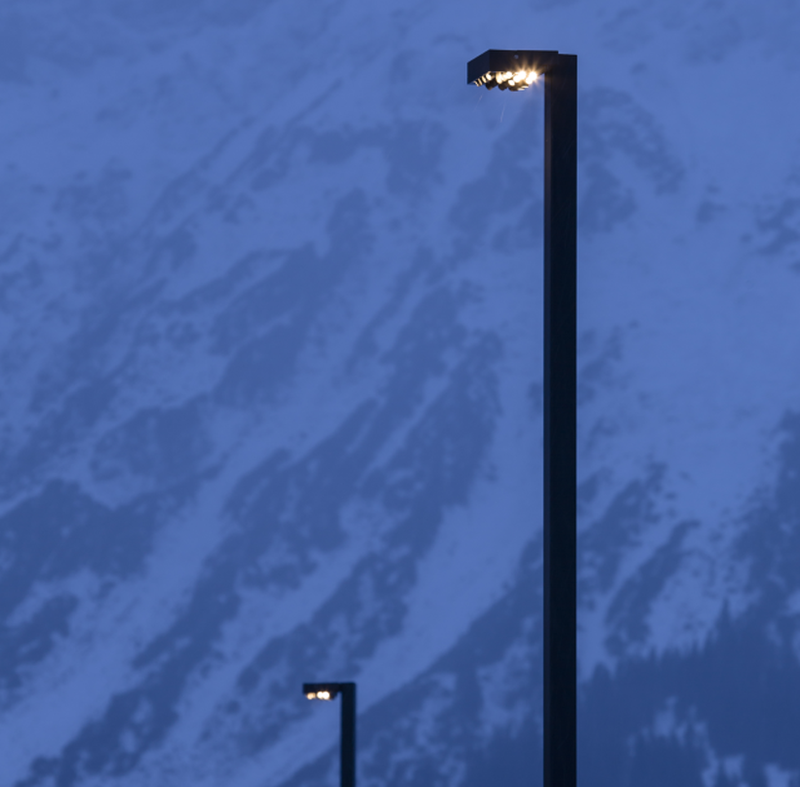 The new urban lighting solution is not just a visual improvement. The precisely focused light, together with the elements reducing the glare effect and an adequate control system, provide a sustainable lighting system. LED luminaires are more efficient and better suited for the environment than the conventional, diffuse-light models, which send 60% of their light towards the sky, and light pollution and the impact on animals are reduced. 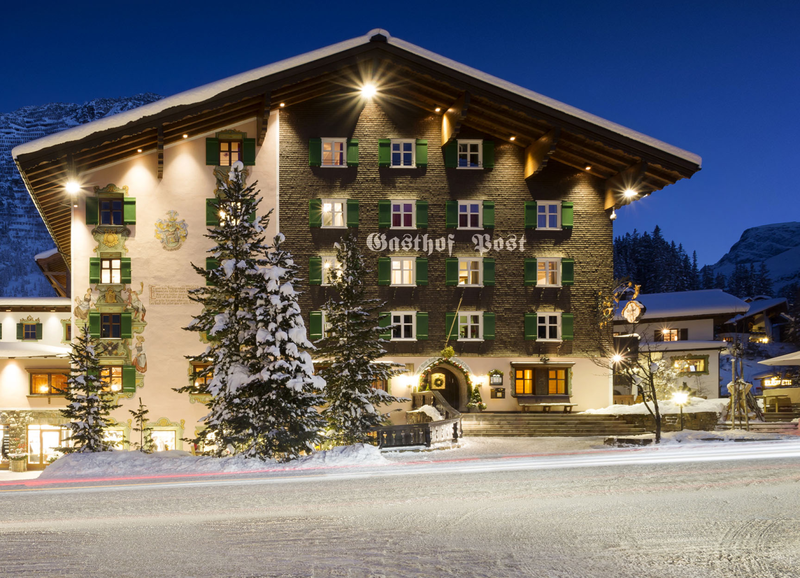 The nocturnal image of the town of Lech is, therefore, an investment in the future, in several ways. The phenomenon of light pollution, also known as ALAN (Artificial Light at Night) represents a process of degradation of the photic habitat. Light pollution has skyrocketed with the development of industry and of urban areas. The source of this type of pollution includes outdoor and indoor architectural lighting, billboards, street lighting, sports facilities, as excess lighting may have undesirable effects on the local ecosystem, from plants to wildlife. The circadian rhythm is a cycle of approximately 24 hours of biochemical processes related to any living being (man, animal, plants, fungi, bacteria). The rhythmicity is present in the patterns of rest, feeding, body temperature, food, brain activity, etc. This rhythm works in tandem with melatonin, an important hormone for the well-being of the body. Melatonin induces the state of rest, aiding the body maintain its 24-hour cycle. Blue light disturbs the production of this hormone, which inhibits sleep, the body being still active. This leads to system disturbance, to fatigue, and, implicitly, to an unhealthy operation. Lighting solutions need to take these factors into account. The inclusion of the control system allows the creation of light scenarios against the time of day, as well as of the urban, but also natural, rhythm. In Lech, the architectural, the street and the indoor lighting are correlated and pre-set to achieve scenarios that gradually reduce light in the urban environment, depending on the inhabitants’ activity, but also function of the circadian rhythm of the natural environment. The Zumtobel Group is an international lighting group, specializing in luminotechnics, an important provider of innovative lighting solutions, lighting components and related services, all under the same umbrella. The acdc brand stands for the powerful and creative force in architectural lighting, which can transform spaces into unique experiences. The Thorn brand represents top of the range, efficient and trustworthy lighting solutions, yielding an excellent quality of light, easy to use, economical, and ThornEco brings LED economy light fixtures. Tridonic is the specialist in developing new LED systems and technologies for connected lighting, it is an active global brand which provides solutions for smart, connected and efficient lighting within a reliable and energy efficient holistic architecture of high-quality hardware and software. The ZGS service portfolio provides answers to the project management of key-turn lighting solutions and includes services for light contracting and technical maintenance and maintenance services worldwide. The Zumtobel brand provides the premium form of architectural lighting, through a professional approach of lighting, a very good price, increased attention to energy efficiency, a unique design approach in searching for perfection, through its unique and timeless design.